The Queen's personal jewelry collection is massive, thanks in large part to the inheritance she received from Queen Mary. 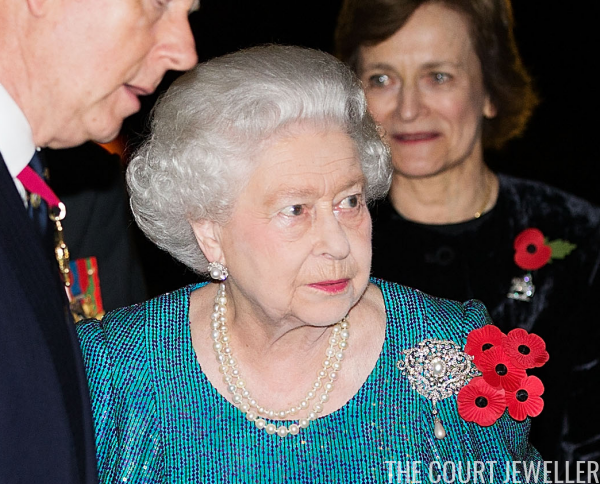 One of the largest brooches in the Queen's jewelry box is yet another legacy from her grandmother: the Richmond Brooch. The brooch, made by Hunt and Roskell, was given to Mary as a wedding present in 1893 by the town of Richmond. Mary's family, the Tecks, had lived at White Lodge in Richmond Park for more than two decades, so although Mary's father's family was German, she really was something of a local girl in the English town. 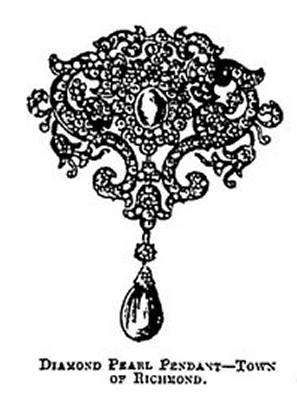 The brooch they offered to Mary was made of diamonds set with two pearls: a large round center pearl, plus a detachable pear-shaped pearl drop. Mary first wore the brooch privately during her honeymoon at Osborne House. It wasn't exactly a private or casual getaway; George and Mary were staying with Queen Victoria, so there were plenty of opportunities for her to wear her new jewels. She also wears the brooch in the bejeweled portrait above, pinned to the bodice of her gown. 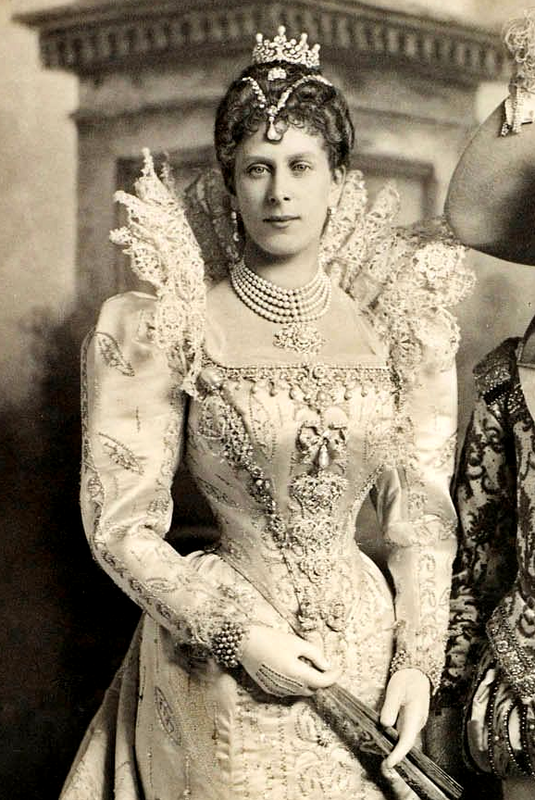 In 1897, she wore the brooch (along with basically the rest of the contents of her jewelry box) at the famed Devonshire House Ball. You can spot the piece being used as a pendant on Mary's pearl necklace in the portrait above. 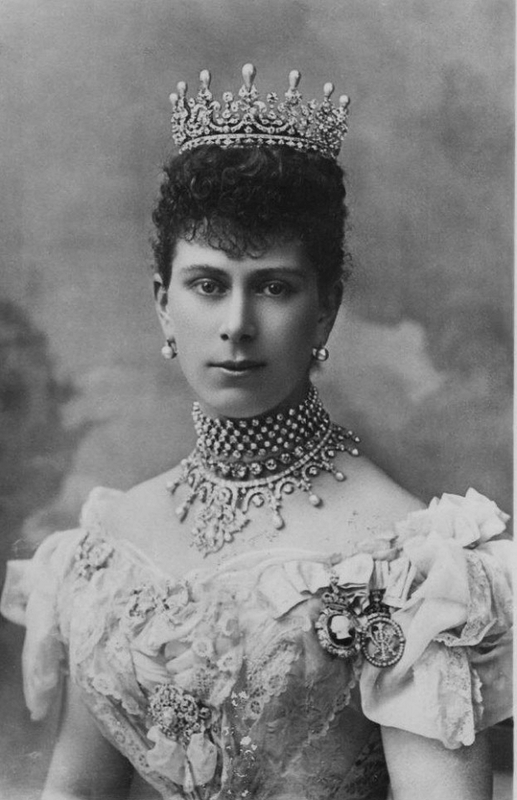 As a brief aside: for a number of years, the pearl pendant was separated from the brooch and used on Queen Mary's Lover's Knot Tiara. 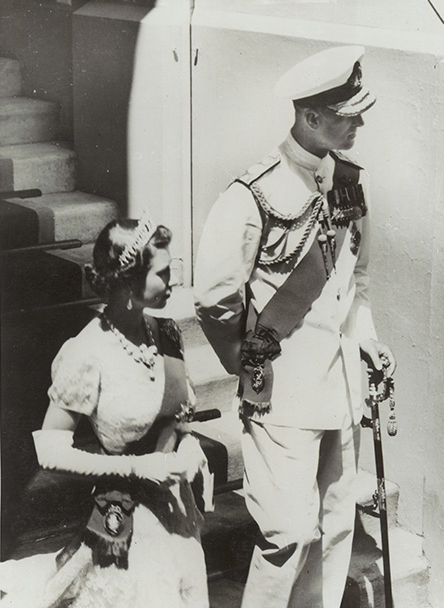 When the upright pearls were eventually removed from that tiara, the pendant was returned to the Richmond Brooch. 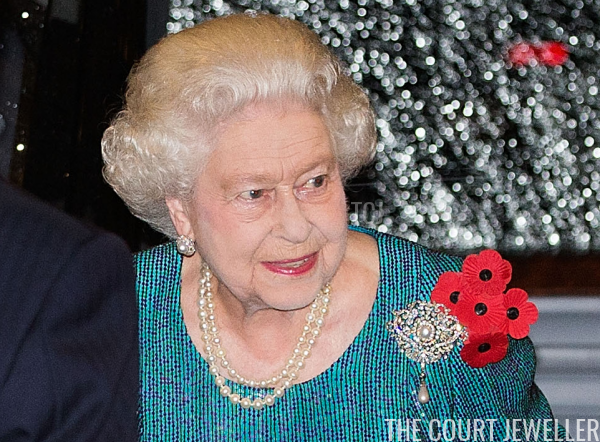 The brooch was among the jewels that the Queen inherited from Mary in 1953. It's a little tough to see, but she's wearing it in the photo above, taken at the opening of parliament in New South Wales in 1954. (You'll spot it pinned to her sash on her left shoulder.) 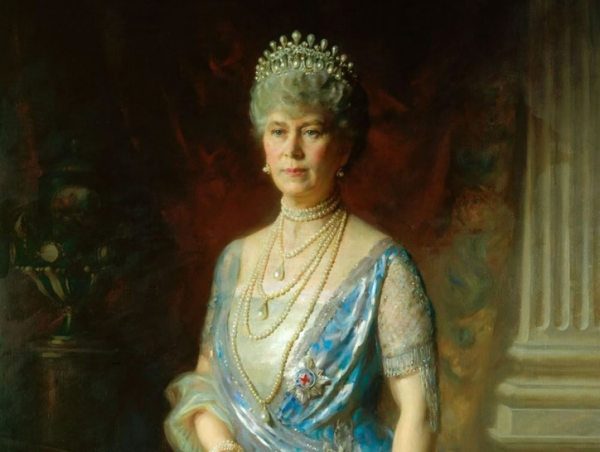 On that occasion, she paired the brooch with the Lover's Knot Tiara and Queen Victoria's Golden Jubilee Necklace. 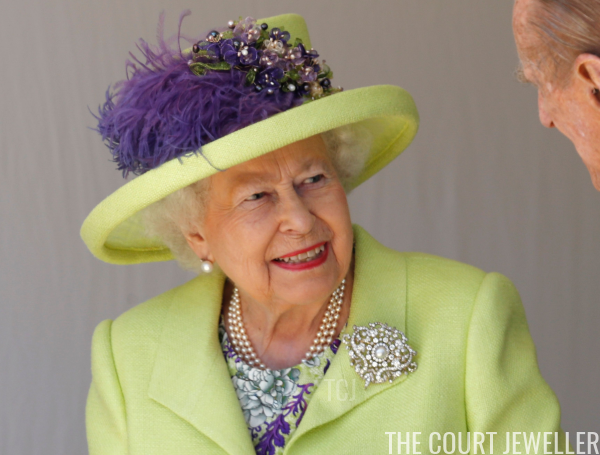 Although she only wore it sparingly during her early reign, in recent years she has worn it fairly regularly, both with the pendant pearl drop and without. 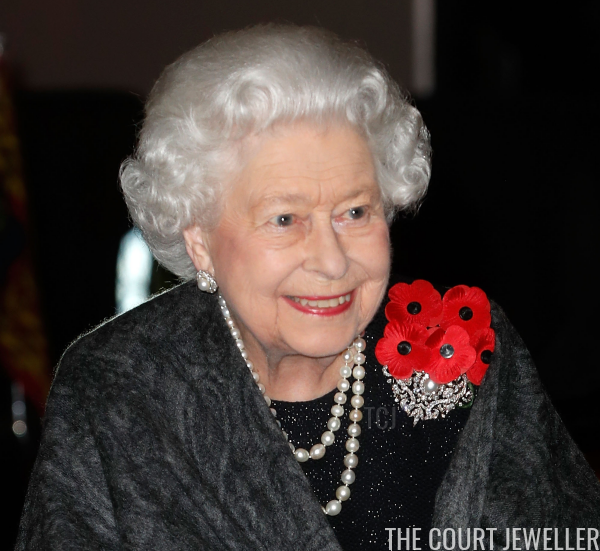 Here, in November 2014, the Queen wears the brooch with its pendant for the annual Festival of Remembrance at the Royal Albert Hall. She wore the brooch without its pendant for the Festival of Remembrance in 2018. But the brooch's most high-profile appearance in recent memory came at the royal wedding of the Duke and Duchess of Sussex. In St. George's Chapel that morning, both the Queen and the bride wore brooches from Queen Mary's wedding gift haul. The central element of the bride's tiara was the County of Lincoln Brooch, another of Mary's wedding presents.